There's much to be learned in Scottish salmon fishing to bring any angler to a level of 'water coverage' skill that will allow them to go onto most salmon beats at any time of the season and at least make a salmon have a 'dunt' at their fly if not hook & land a fish. To assist that process it's important that you hit it off with the resident beat ghillie and here are a few things that will definitely improve your chances of that. A professional beat ghillie needs to be given his place as in many occasions he will be responsible for the enjoyment & personal safety of many fishing guests on any one fishing day and not just yourself. Turning up on time is a great starting point as a late arrival at the salmon fishing venue often interferes not only with your own fishing day but can hold up other paying guests too. If you're running late for any unexpected reason at least make a phone call to the ghillie (or their agent) to advise the ghillie of your delayed arrival time. Regardless of how expert a salmon fisher is at catching salmon a professional beat ghillie will always have the advantage when it comes to his own individual beat. The professional beat ghillie gets to see all the holding areas and flight paths of salmon through every fishing day of the season and in all of the varying water heights. Listening closely when these 'hot spots' are being detailed is naturally going to save you much experimentation time and will instantly give you your bearings as to where the likely salmon 'holding & taking' areas will be. Ignoring this advice will not go unnoticed and will diminish your chances of success. The 'permit only' low cost approach is great to encourage anglers into Scottish salmon fishing on the face of it. My opinion is that it's done much more harm than good as many inexperienced anglers turn up looking for tuition and sometimes even the loan of fishing equipment when they've only booked salmon fishing permit access. A professional ghillie will usually start their career giving fishing kit & tuition away for free until he takes stock of what he's losing each year and how many times a guest he's over extended to walks away at 5pm without so much as a thank you! 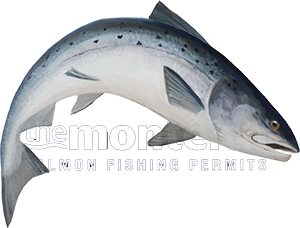 Before you buy a salmon fishing permit be honest with yourself and ask yourself the question are your salmon fishing skills and equipment levels good enough to do justice to the salmon beat you've booked your permit for. If the answer is an honest no then call the beat ghillie and see if he can assist you with some extra cost tuition or equipment hire. Turning up on any salmon beat expecting either of the above could in most cases put a strain on your relationship with the ghillie and also not be possible logistically that day due to the ghillie having other guest commitments or beat management duties to perform. Most professional beat ghillies in Scotland have chosen their careers based on a love of the salmon river, entertaining fishing guests and helping them to catch salmon. These salmon river career jobs tend not to be the highest paid in society even though they are rewarding in other areas. If you've had a reasonably good day on the river and the beat ghillie has been helpful as best he can it is customary to tip the ghillie on departure. These days an average tip is £20 per head per day and this form of gratuity is much more responsible from the visiting angler than a bottle of whisky even though that may be strongly disputed!